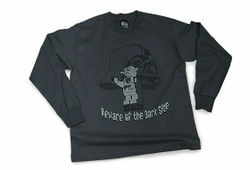 TS64 LEGO Star Wars Beware of the Dark Side T-shirt is a Star Wars T-Shirt released in 2007. It has a gray picture of LEGO Yoda with the words "Beware of the Dark Side" below him. It comes in YS, YM, YL, AS, AM, AL, and AXL sizes. Facts about "TS64 Star Wars Beware of the Dark Side T-shirt"
This page was last edited on 12 January 2016, at 23:59.